It was on my birthday last year when Jeff gave me a Samsung S3 and immediately thought to purchase a cover to protect it..I'm very clumsy you see, I tend to drop things a lot. And I remember one night I was walking around a night market in Chinatown and found a stall selling fancy Samsung S3 Phone covers for a hefty price, $30-$50 or more for custom made design. I wanted one so badly but was not prepared to pay the price. So I decided since I had a big stash of beads and embellishments, why not make one myself. 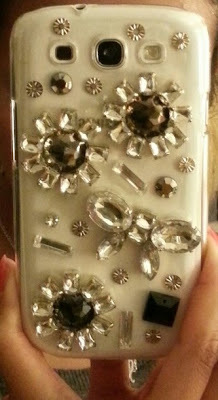 And so I purchased a clear Samsung S3 case from Ebay for $5 and with my hot glue gun..whalah!